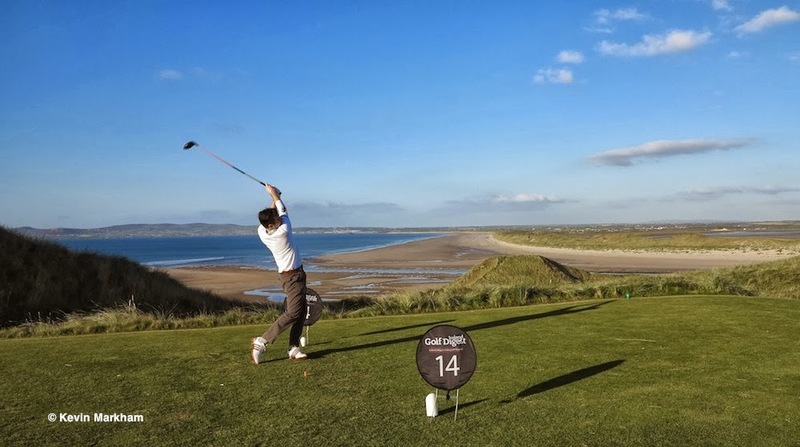 The weather was incredible, the scenery stunning and the course is an incredible piece of design that combines the genius of Arnold Palmer with the hand of God... at least that's how Palmer sees it. And he's mostly right. The back nine is a sight and a challenge to behold, with flags hanging on the skyline and chasms so deep you need mountain gear to get down... or get back up. 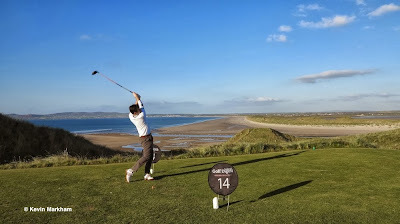 Frank drives off the 14th, the beach from 'Ryan's Daughter' beyond. This was the third GDI event I've played in this year and they are seriously good fun. 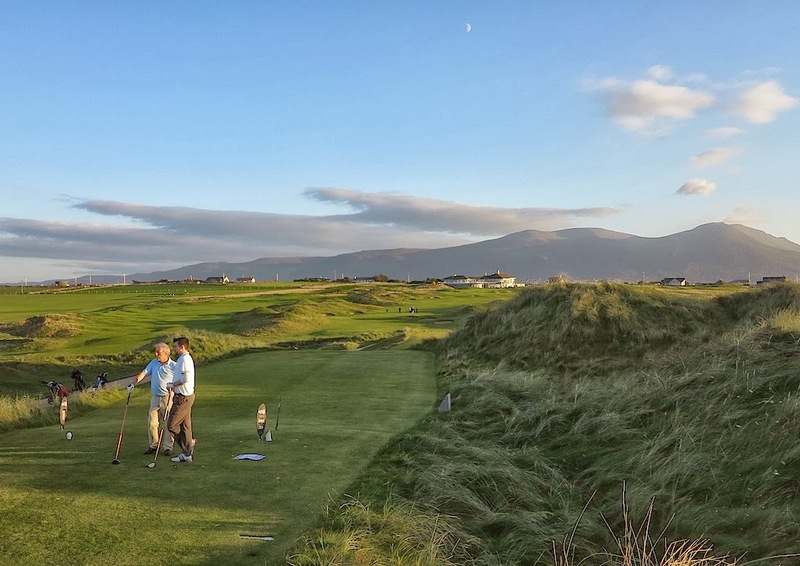 It's a fourball Stableford Singles format and that inevitably means the rounds are slow. Tralee was a six hour behemoth with waits on every tee and every approach. 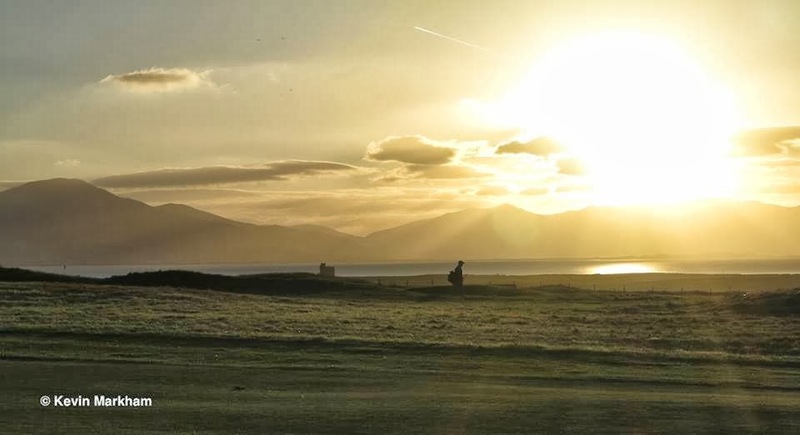 In the cold and rain maybe that would be unbearable, but in warm, glorious sunshine it simply gave more time to soak in the surroundings and try to figure out why your golf has gone to crap. I was playing with a father and son, Paddy and Frank O'Leary, from Macroom. Our fourth never showed. For a while, Frank, playing off 15, was in with a shout. He was scoring well and while he only had 15 points after nine holes, I still reckoned a decent back nine would get him into contention. 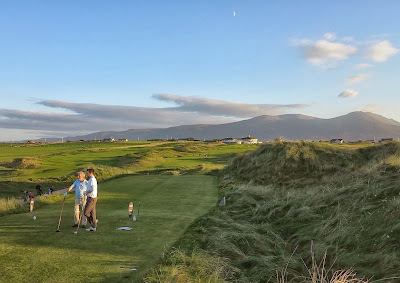 For someone playing a links for the first time he did very well, but the back nine was his undoing as a couple of balls went astray and a couple of three putts took the wind out of his sails. moon rising above the clubhouse. As it turned out he wouldn't have got close to the prizes. In his category (H'cap 13-24) 40 points came 2nd and 3rd, while 44 points won it. That's some shooting. In the lower category (1-12), 41 points won - a 6 handicapper going around in 1 over is fine shooting and amounted to almost three times my score. Still, Paddy and Frank didn't do too badly - winning a pair of sunglasses and a fourball for Enniscrone in the raffle, while I was left with a chicken salad and a half of lager. You can't win them all! A full set of photos of Tralee are here. 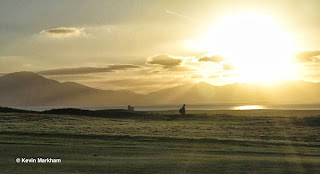 Easy to see why Tralee Golf Club is one of the world's Top Ten Ocean Courses and of Ireland's best links.